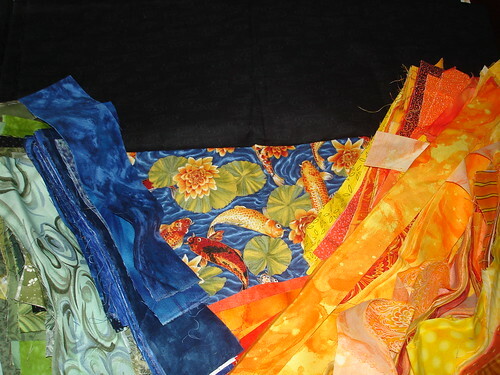 I would definitely put in the third fabric from the right, top row. You need another dark to balance the solid dark. Wanda's got you covered and I'm thinking "How cool is this?!" I would definitely include the dark olive print, fourth one from the right on the top row, and maybe even the lighter olive print, fifth from the right, too. Of course, you can't get too scrappy for my taste. You might like a little more controlled. Love them! Who makes the martian print? Adorable! Love that martian fabric! Where do you find unique fabrics like this?!? I'm feeling like I want one TINY bit of yellow as a blender. I realize it's kind of mono-chromatic in greens, I love a little bit of sparkle. I do like Wanda's suggestion too. It's going to be awesome nevertheless!!! 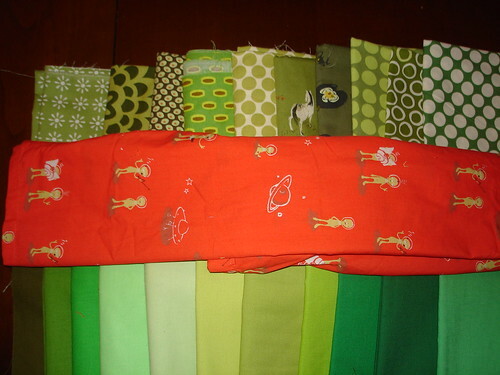 Ok, I have to be another to drool over the orange martian fabric - source? Pretty please?